We’ve already touched on how light affects sleep. Most discussions on the subject focus on artificial light, especially the blue light that comes from electronic devices. But what exactly do we mean by the term “blue light,” and is it the only type that influences how we sleep? Of the whole range of wavelengths that light encompasses, our eyes can only detect a fraction. This is what we call the visible spectrum. It has seven major bands, with wavelengths ranging from 400 nanometers (nm) to around 700 nm. Thanks to these differences in wavelength, we see each band as a distinct color. 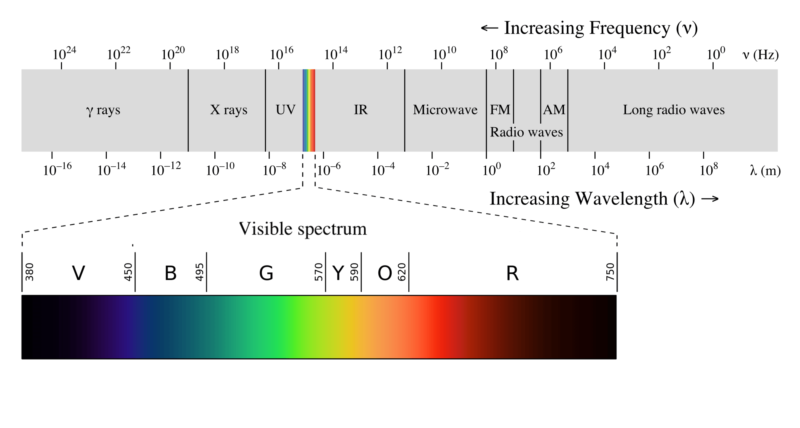 That’s how we get the term “blue light,” which refers to a specific band near the middle of the spectrum. As you might have noticed, the visible spectrum’s bands correspond to the colors of the rainbow. That’s no accident: rainbows are formed when water droplets in the air act as a prism, which each band of the spectrum hits at different angles. This causes sunlight to refract or disperse into its component “colors.” This tells us that “white” light is actually all of these bands or colors mixed together. However, it isn’t always an even mix. Let’s take a closer look at sunlight, which is responsible for the bulk of our day-to-day illumination. When the sun’s rays reach the Earth, they strike particles in our atmosphere; the little bursts of energy generated by these reactions determine the wavelength composition of the light that eventually reaches our eyes. As the day goes on, the sun’s rays come in at new angles, and the atmospheric collisions they generate also change. Consequently, the light we see changes in “color” or wavelength composition over the course of the day. Our eyes detect all these subtle shifts, though we might not be conscious of the whole process. We can thank our retinas’ “photopigments”—special proteins that react to light—for that sensitivity. These photopigments undergo chemical changes when exposed to light, translating that input into biochemical signals. Like the reactions in our atmosphere, the signals produced by these biochemical changes vary depending on the nature of the light involved. Our sight works by taking in light and translating that into biochemical signals that our brain can understand. Those signals don’t just become the images that form our vision, though. Melanopsin, one of our retinas’ photopigments, also processes light into valuable cues for our body clocks. It’s the main protein responsible for sparking the internal pathways that keep the suprachiasmatic nucleus, also known as our body’s master clock, aware of our light exposure throughout the day. This means melanopsin is also the key to understanding how different types of light can have drastic effects on how we sleep. Like other photopigments in our retinas, melanopsin doesn’t react to the full spectrum of light. Instead, it’s more reactive to wavelengths in the range of 470-480nm, which corresponds to the blue band of the visible spectrum. Several studies have picked up on this detail and compared the effect of different colors of light on our wakefulness. Against green light, for example, blue light has been shown to induce a more drastic reduction in sleepiness. A more recent study done on mice found that, while blue light boosted alertness more than violet and green light, test subjects quickly fell asleep when exposed to green light. The same study noted, however, that green light could be expected to have an opposite effect on people, who are—unlike mice—active in the daytime. It isn’t just about colors the “cooler” end of the visible spectrum. Working off the knowledge of melanopsin’s sensitivity to blue light, many research studies have looked into the effects of light from the opposite end of the spectrum: “warmer” colors like orange and red. 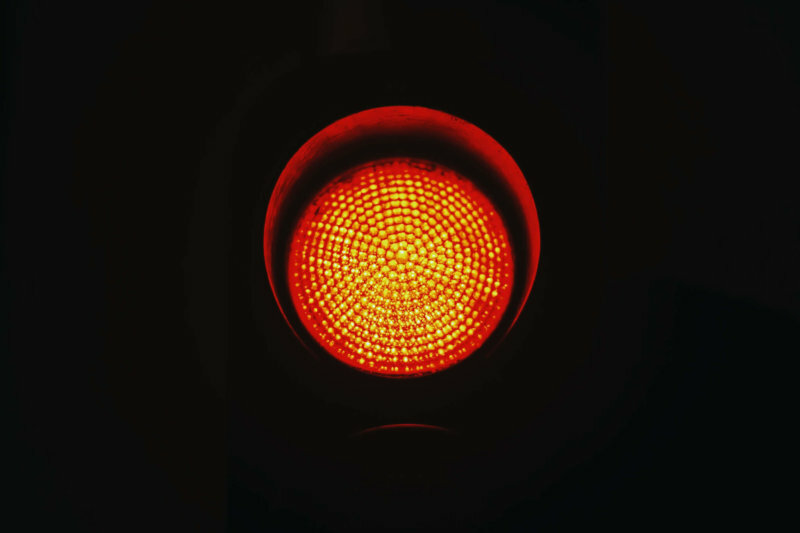 Of these, red light features most prominently in scientific studies, and the research points to some fascinating implications for how we can use lighting color to optimize our sleeping habits. Light in any form is guaranteed to keep us awake, but it turns out that color can determine whether that light exposure disrupts our sleeping cycle or not. A study from the Rensselaer Polytechnic Institute’s Lighting Research Center demonstrates this well: similar to blue light, red light was shown to boost alertness and performance in night-shift workers. But unlike light from the “cooler” bands of the spectrum, red light elicited these results without suppressing melatonin production. Since red light doesn’t affect our circadian rhythms’ underlying biochemical mechanisms, exposure isn’t expected to alter our sleeping patterns in the long term, even if it does keep us awake outside our regular sleeping hours. In fact, another study found that, compared to white light, red light exposure helped night-shift workers resettle into normal sleeping patterns faster. Similarly, red light has been shown to help ease the transition from sleep to waking. If you’ve ever woken up groggy and sluggish after a nap, then you know how difficult that transition can sometimes be. Research shows that exposure to red light while sleeping can reduce the intensity and duration of that “groggy” period, with participants registering better reaction times and performance compared to those who didn’t receive any light treatment before or after waking. These positive effects can persist and add up over time, too, as demonstrated by a study that found athletes reporting better sleep quality and endurance after regular exposure to red light. Light affects how we sleep: illumination helps keep us alert and awake, but too much can also disrupt our sleep patterns and throw off our body clocks in the long term. As it turns out, though, some types of light affect us more than others, thanks to sensitive pigments found in our eyes. While blue light can deliver the biggest gains when it comes to alertness and performance, it can also have the most detrimental effects on our sleeping patterns. Regular exposure, whether through device screens or bright LED home fixtures, can bring changes that extend to the biochemical aspects of our circadian rhythms—leading to disruptions that can be hard to reverse. This holds true even for light that skews closer to other colors on the “cooler” end of the visible spectrum, like green and violet. Blue-rich lighting can be a quick trick for curing sleepiness or sluggishness, but it’s a solution best used in the daytime; otherwise, prolonged exposure, especially at night, can quickly wreak long-term havoc on our bodies. Research points to “warmer”-colored light as a better alternative, especially for people who need the light for nighttime work, or for activities that require a break from their typical sleeping hours. While not as potent as blue light when it comes to warding off sleep, red light and similar types of illumination can still aid wakefulness and bump up performance—without disrupting the biological mechanisms that sustain our circadian patterns.